Muntingia, or JamaicaCherry, is a small, fast–‐growing tree that can reach up to 40 ft. tall at full maturity. The soft leaves are evergreen and have an alternate phyllotaxy. Leaves are dark green on top and light green underneath. The small, white flowers feature yellow stamens in the center. The small, round fruits are abundant, and depending on the variety, have a red or yellow color. Fruits are edible raw or made into jam. The fruit possessed potent anti-inflammatory activity. The flowers have antiseptic and antispasmodic qualities, and are made into medicinal teas. The M. calabura leaves exhibited potential anti-proliferative and antioxidant activities. The present study on Muntingia is to give an overview on traditional uses and pharmacological activity. There has been an increased urgency to discover novel antibiotics/anti microbial compounds due to emergence of drug resistant microorganisms. Therefore, an infection caused by antibiotic resistant microbes complicates conventional treatment causing prolonged illness and increases the death risks. Many medical practitioner also employ traditional (Ayurvedic) medicine, in Western and other developing nations like India, in complementary to modern medicines. Today also, as a testament to its persistence, over 80% of people in the world still utilize traditional medicine for primary healthcare. Many underdeveloped countries are rich in biodiversity hotspots like Southeast Asia, Africa, Central and Southern America. Among all the natural resources, plants are the single largest source for traditional medicines, accounting for 25% of new drugs components being tested for clinical trials (Singh et al.,2017). 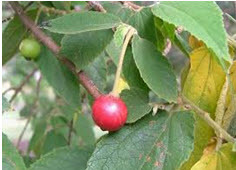 Cherry leaves (Muntingia calabura) contains antioxidants that generally form by phenolic or pholifenols, the sinamat acid derivatives, flavonoids, tocopherols, coumarin and polifungsional acids. Flavonoids that have an antioxidant activity consist of flavonol, flavanon, flavones, isoflavones, catechins and kalkon. Phenolic compounds that have antioxidant activity can be known through the way of extraction. Extractions are a way to separate a desired substance when it is mixed with others. The mixture is brought into contact with a solvent in which the substance of interest is soluble, but the other substances present are insoluble. Components of active compounds from plants or animals can be extracted based on “Like Dissolved Like Theory” , compounds will be extracted depends on solubility (Triswaningsih et al.,2017). Medicinal plants are sources of important therapeutic aid for alleviating human ailments. Approximately 80% of the people in the developing countries all over the world depend on the traditional medicine for their primary health-care. Interestingly, approximately 85% of traditional medicine involves the use of plant extracts. Interest in phytomedicine started in the last 20 years and with increasing awareness of the health hazards and toxicities associated with unsystematic use of synthetic drugs and antibiotics, interest in the use of plants and plant-based drugs has revived throughout the world. However, a large number of medicinal plants remain to be investigated for their possible pharmacological value. One of the plants that has recently gained a medicinal plantstatus is Muntingia calabura L. (Elaeocarpaceae). 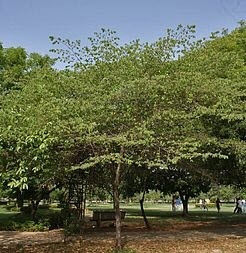 Muntingia, or Jamaica Cherry, is a small, fast-growing tree that can reach up to 40 ft. tall at full maturity. The soft leaves are evergreen and have an alternate phyllotaxy. Leaves are dark green on top and light green underneath. The small, white flowers feature yellow stamens in the center. The small, round fruits are abundant, and depending on the variety, have a red or yellow color (Mahmood et al., 2014). Muntingia, also known as Jamaica Cherry, is widely grown in the tropics and subtropics worldwide. By the early 1900s, Muntingia was popular in Southeast Asia, and in 1922, the USDA introduced several trees to Hawaii, USA. In 1926, Dr. David Fairchild collected seeds from a yellow–‐fruit variety in Ceylon, and by the 1930s, Muntingia could be found in home gardens throughout south Florida. Today, Muntingia is very popular throughout Southeast Asia, especially in the Philippines, but is not very widespread in south Florida. The Jamaica cherry is indigenous to southern Mexico, Central America, tropical South America, the Greater Antilles, St. Vincent and Trinidad. The type specimen was collected in Jamaica. It is widely cultivated in warm areas of the New World and in India, south-east Asia, Malaya, Indonesia, and the Philippines, in many places so thoroughly naturalized that it is thought by the local people to be native. Macmillan says that it was first planted in Ceylon about 1912. Several trees were introduced into Hawaii by the United States Department of Agriculture in 1922. Dr. David Fairchild collected seeds of a yellow-fruited form in the Peradeniya. Botanic Gardens, Ceylon, in 1926. The tree has been grown in southern Florida for its fruits and as quick shade for nursery plants. It is seldom planted at present. Volunteers from bird-distributed seeds spring up in disturbed hammocks and pinelands. The author supplied seeds requested by the Kenya Agriculture Research Institute, Kihuyu, in 1982. The Jamaica cherry is said to grow better than any other tree in the polluted air of Metropolitan Manila. It runs wild on denuded mountainsides and on cliffs and is being evaluated for reforestation in the Philippines where other trees have failed to grow and also for wildlife sanctuaries since birds and bats are partial to the fruits. The fruits are sold in Mexican markets. In Brazil, they are considered too small to be of commercial value but it is recommended that the tree be planted on river banks so that the abundance of flowers and fruits falling into the water will serve as bait, attracting fish for the benefit of fishermen. In Malaya, the tree is considered a nuisance in the home garden because fruit-bats consume the fruits and then spend the day under the eaves of houses and disfigure the porch and terrace with their pink, seedy droppings. Antioxidant activity; improvement in endothelial function, vascular function, and insulin sensitivity; as well asattenuation of platelet reactivity and reduction in blood pressure. Moreover proper scientific screening of potential bio actives of these plants followed by chemical investigations is necessary to make these herbal remedies more viable. In this context, the present study was undertaken to evaluate the antioxidant of Muntingia calabura(raw fruit). The emergences of various types of diseases, both infectious or non-infectious, nowadays have become a major global burden. Various pharmaceutical drugs have been developed and prescribed to patients to help cure those diseases. Unfortunately, conventional drugs have also been associated with various unwanted side effects. For example, morphine has been known to cause phenomenon such as tolerance and dependence while the appearance of antibiotic-resistance bacteria such as methicillin- and vancomycin-resistance bacteria have been well documented. Due to these problems, patients have been looking for other alternative to treat their diseases, where complementary and alternative medicine (CAM), particularly the plant based medicines, has been one of the sources of the CAM used. One of the plants that have recently gained attention among researchers throughout the world is M. calabura. Based on the literature searches carried out, this plant has limited traditional uses throughout the world with medicinal uses recorded in, particularly, Peru, Colombia, Mexico, Vietnam and Philippines. This might explain why M. calabura medicinal value is not well documented in Malaysia and why it is considered as a neglected plant. Despite the lack of traditional claims, various parts of the plant have been used to treat different types of illnesses. In Peruvian folklore medicine, the flowers and barks are used as an antiseptic and to reduce swelling in lower extremities while the leaves, either boiled or steeped in water, are used to reduce gastric ulcer and swelling of prostate gland, and to alleviate headache and cold. Moreover, the boiled barks can be used as a wash to reduce swelling in the lower extremities. In Colombia, the infusion of the flowers is used as a tranquillizer and tonic. In Mexico, the plant is used to treat measles, mouth pimples and stomach ache. In Philippines, the flowers is also used to treat headache and incipient cold or as tranquillizers, antispasmodics and antidyspeptics. Other than that, the roots of M. calabura have been used as an emmenogogue in Vietnam and as an abortifacient in Malaysia. Other than for medicinal uses, the fruit, which are sometimes eaten fresh, are frequently cooked in tarts or made into jam, while the leaf infusion is drunk as a tea-like beverage. Wood: The sapwood is yellowish, the heartwood red-dish-brown, firm, compact, fine-grained, moderately strong, light in weight, durable indoors, easily worked, and useful for interior sheathing, small boxes, casks, and general carpentry. It is valued mostly as fuel, for it ignites quickly, burns with intense heat and gives off very little smoke. Jamaicans seek out trees blown down by storms, let them dry for a while and then cut them up, preferring this to any other wood for cooking. It is being evaluated in Brazil as a source of paper pulp. Bark: The bark is commonly used for lashing together the supports of rural houses. It yields a very strong, soft fiber for twine and large ropes. Since 1991 to date, various phytochemical constituents have been isolated from different parts of M. calabura. Kaneda et al. (1991) were the first to isolate bioactive compounds from the roots of M. calabura. 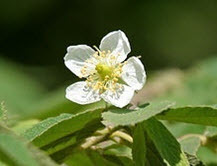 They reported on the isolation of 12 flavonoids from methanol extract of M. calabura roots (MEMCR) namely (2S)-5ʹ-hydroxy-7,3ʹ,4ʹ- 7 trimethoxyflavan (1), (2S)-7,8,3ʹ,4ʹ,5ʹ-pentamethoxyflavan (2), (2S)-2ʹ-hydroxy- 7,8,3ʹ,4ʹ,5ʹ- pentamethoxyflavan (3), (2S)-5ʹ-hydroxy-7,8,3ʹ,4ʹ-tetramethoxyflavan(4), (2S)-8-hydroxy-7,3ʹ,4ʹ,5ʹ-tetramethoxyflavan (5), (2S)-8,2ʹ-dihydroxy-7,3ʹ,4ʹ,5ʹ- tetramethoxyflavan (6), (2S)-8,5ʹ-dihydroxy-7,3ʹ,4ʹ-trimethoxyflavan (7), 7,8,3ʹ,4ʹ,5ʹ- pentamethoxyflavone (8), (M),(2S),(2ʹʹS)-,(P),(2S),(2ʹʹS)-8,8ʹʹ-5ʹ-trihydroxy-7,7ʹ-3ʹ,3ʹʹʹ- 4ʹ,4ʹʹʹ-5ʹʹʹ-heptamethoxy-5,5ʹʹ-biflavan (9), 5ʹ-hydroxy-7,8,3ʹ4ʹ-tetramethoxyflavone (10), (M),(2S),(2ʹʹS)-,(P),(2S),(2ʹʹS)-8,8ʹʹ-5ʹ-5ʹʹʹ-tetrahydroxy-7ʹ,7ʹʹ-3ʹ,3ʹʹʹ-4ʹ,4ʹʹʹ-hexamethoxy- 5ʹ,5ʹʹʹ-biflavan (11) and 8,5ʹ-dihydroxy-7,3ʹ,4ʹ-trimethoxyflavone (12) (Consolacion et al.,2015). The first attempt to study the antibacterial activity of M. calabura was carried out by using the leaves and fruits collected in the State of Puebla and State of Veracruz, Mexico. The MEMCL and methanol extract of M. calabura fruits (MEMCFr) diluted in 100 mg/mL of DMSO concentration were subjected to two-fold serial dilutions and then tested against Escherichia coli (C600) and Staphylococcus aureus (209 P) using the micro-dilution assay. Both MEMCL and MEMCFr exhibited antibacterial activity against E. coli and S. aureus with the recorded MIC of 512 and 1024 mg/mL, and 128 and 256 mg/mL, respectively. This was followed by another antibacterial activity report by Zakaria et al. (2007b), who studied the antibacterial properties of MEMCL, aqueous (AEMCL), and chloroform (CEMCL) extract of M. calabura leaves, collected from Shah Alam Selangor, Malaysia, between January and February 2005. These extracts, prepared at various concentrations (10 000, 40 000, 70 000 and 100 000 ppm), were tested against Corneybacterium diphtheria, S. aureus, Bacillus cereus, Proteus vulgaris, Staphylococcus epidermidis, Kosuriarhizophila, Shigellaflexneri, E. coli, Aeromonashydrophila, and Salmonella typhi using the in vitro disc diffusion method. The results showed that CEMCL was less effective as compared with the AEMCL and MEMCL. At all concentrations tested, AEMCL inhibited the growth of S. aureus and K. rhizophila while MEMCL exerted antibacterial activity against S. flexneri, B, cereus, S. aureus, P. vulgaris, A. hydrophila, and K. rhizophila (Consolacion et al.,2015). Only one study related to investigation of insecticidal activity of M. calabura was recordedusing the flowers and fruits collected from the Universidade Rural Federal de Pernambuco (UFRPE), Recife, Brazil. The authors prepared two types of extracts from M. calabura flowers and fruits, namely ethanol extracts [flowers (EEMCFl) and fruits (EEMCFr)], and hexane extracts [flowers (HEMCFl) and fruits (HEMCFr)], at concentrations ranging from 0.25 to 30.0 mg/mL, and tested them against Plutellaxylostella larvae and pupae using leaf disc immersion assay. All extracts were reported to be toxic to the larvae and pupae of P. xylostella. Moreover, the EEMCFl and EEMCFr were the most toxic against first instar P. xylostella larvae with the recorded LC50 of 0.61 mg/mL and 1.63 mg/mL, respectively. This is followed by the HEMCFr (LC50¼5.5 mg/mL) and HEMCFl (LC50¼18.9 mg/mL). When comparing their relative toxicities, it is worth highlighting that EEMCFl was 31.0-foldmore toxic than HEMCFl, and 4.2 – and 8.9-fold more toxic than EEMCFr and HEMCFr, respectively. Overall, theseextracts were more effective than cordycepin, the reference drug, which produced 100% mortality only at 500 mg/mL in 72 h (Zakaria et al., 2010). The first attempt to investigate the antinociceptive activity of M. calabura was made usingthe leaves collected from Shah Alam, Selangor, Malaysia,between January and February, 2004, AEMCL was prepared inconcentrations of 10, 50, and 100% strength that is equivalentto 27, 135, and 270 mg/kg, was subjected to the acetic acidinducedabdominal constriction test followed by anotherstudies to determine the role of L-arginine/nitric oxide/cyclic-guanosine monophosphate (L-argentine/NO/cGMP)pathway in the observed antinociceptive activity of AEMCL.From the results obtained, AEMCL exerted a significant and concentration-dependentantinociceptive activity whenassessed using the abdominal constriction test. Pre-treatmentwith L-arginine significantly blocked the antinociceptiveactivity of the extract at the highest concentration while pretreatmentwith NG-nitro-L-arginine methyl esters (L-NAME)significantly enhances the antinociceptive effects at low,concentration but inhibit its effect at higher concentration ofAEMCL. Methylene blue (MB) significantly enhancedAEMCL antinociceptive activity at all concentrations used.Co-treatment of L-arginine with L-NAME or MB togethersignificantly reversed the antinociceptive activity of AEMCLat low concentration without affecting other concentrations ofthe AEMCL. These findings suggested the involvement of Larginine/NO/cGMP pathway in modulating the antinociceptiveactivity of AEMCL. Acetylsalicylic acid (ASA), in the dose of10 mg/kg, was used as the reference drug (Zakaria et al., 2007). A year later, another report on the antinociceptive activityof M. calabura leaves was released. This time, the leaves were collected between July and August,2005 from Shah Alam, Selangor, Malaysia, and prepared asCEMCL, in the concentrations of 10, 50, and 100% strength.CEMCL was tested for its antinociceptive activity using the abdominal constriction test, the hot plate test, and theformalin test. In the abdominal constriction test, the extract exhibited a concentration-dependent activity with CEMCL atthe highest concentration producing 495% analgesia while CEMCL at 50% concentration produced an activity that wasequieffective to that of 100 mg/kg ASA (the reference drug).The extract also exerted an antinociceptive effect, but in aconcentration-independent manner, when assessed using thehot plate test with the onset of activity depending on theconcentration of CEMCL. However, the activity exerted byCEMCL, at all concentrations used, was overshadowed by theactivity exhibited by 5 mg/kg morphine. The extract alsodemonstrated antinociceptive activity when assessed using theformalin test, which was seen in both early and late phases ofthe test. However, the concentration-dependent activity byCEMCL was observed only in the early phase of the formalintest. The reference drugs used in the formalin test were 5 mg/kg morphine for the early and late phase, and 100 mg/kg ASA,for the late phase (Preethi et al.,2011). Theleaves were prepared as CEMCL, in the concentrations of 10, 50, and 100%, and tested using the carrageenan-induced paw edema test. ASA (100 mg/kg) was used as a reference drug. All concentrations of CEMCL exerted an inconsistent anti-inflammatory activity that was less effective than the ASA. Another report on the anti-inflammatory activity of M. calabura leaves was also published while attempting to determine the antinociceptive activity of AEMCL. In this study AEMCL was prepared in the concentrations of 10, 50, and 100% (equivalent to the doses of 27, 135, and 270 mg/kg, respectively) and subjected to the carrageenan-induced paw edema assay. The results obtained demonstrated that the extract exhibited concentration-independent anti-inflammatory activity. The anti-inflammatory activity of the 10 and 50% AEMCL were completely lost after 7 h of its administration while the anti-inflammatory activity of 100% AEMCL was lost after only 6 h of its administration. It is worth mentioning that the anti-inflammatory activity of AEMCL, at the concentrations of 10 and 50%, was significantly greater than the reference drug, 100 mg/kg ASA, at the interval of 3 and 4 h after their administration. In the recent attempt to study the pharmacological properties of the fruits of M. calabura, the MEMCFr and AEMCFr were prepared in doses of 200 and 400 mg/kg and tested using the carrageenan-induced paw edema test (Preethi et al., 2012a). The results obtained demonstrated that both extracts exerted dose-dependent inhibition of carrageenan induced localized edema at 4 h after the administration of extracts. The significant anti-inflammatory activity was recorded at 24.5 and 44.2% for both doses of MEMCFr and at 20.4 and 46.2% for both doses of AEMCFr. Indomethacin, in the dose of 10 mg/kg, was used as the reference drug and caused 84.3% inhibition of carrageenan-induced edema formation in comparison with the extracts (Zakaria et al., 2007). The first attempt to determine the antipyretic potential of M. calabura was made by using the leaves that was prepared as CEMCL. The extract, at the concentrations of 10, 50, and 100%, was tested using Brewer’s yeast (BY)-induced pyrexia test. The extract exhibited a concentration- independent antipyretic activity. Comparison made against the 100 mg/kg ASA, as the reference drug, showed that the CEMCL antipyretic activity was less effective than the drug. Another report on the antipyretic activity of another extract of M. calabura, namely AEMCL, while studying the antinociceptive and anti-inflammatory activities. The AEMCL exerted a concentration-independent antipyretic effect with the onset of effects of 27 and 135 mg/ kg AEMCL was recorded after 240 min of their administration. Overall, the antipyretic activity of AEMCL was less effective than the reference drug, 100 mg/kg ASA (Preethi et al., 2010). The investigation of antiulcer potential of M. calabura wasinitiated with one study. This preliminary study was carried out by involving the use of M. calabura leaves obtained from acompany, Ethno Resources Sdn. Bhd., Selangor, Malaysia. The leaves were prepared as EEMCL, in the dose of 250 and 500 mg/kg, and assayed only against the ethanol-induced gastric ulcer model. The extract demonstrated significant and dose-dependent antiulcer activity indicated by the reduction in the areas of gastric ulcer injuries (112.5±2.11 and 95.08±2.18mm2) in comparison with the negative control group (735.25± 2.12mm2) and 20 mg/kg omeprazole-treated group (the reference drug; 90.33±2.02mm2). Further study on the ethanol-treated stomach samples revealed that the EEMCL reduces the acidity of gastric content while increases the mucus production of gastric mucosa when compared with the negative control. Moreover, the subsequent microscopic observations supported the macroscopic findings. Another study on the antiulcer potential of M. calabura leaves was studied. In this study, the leaves were prepared as MEMCL and subjected to ethanol- and indomethacin-induced gastric ulcers wherein in the former assay the doses of 25, 50, 100, 250, and 500 mg/ kg were used while in the later assay, the doses of 100, 250, ad 500 mg/kg were used. The discrepancy in the range of doses used was attributed to preliminary findings using the ethanol-induced gastric ulcer model wherein the extract exerted a dose-independent antiulcer activity. Therefore, an additional study using lower doses (25 and 50 mg/kg) was performed (Sridhar et al., 2011). Moreover, the role of NO and sulfhydryl groups in mediating the antiulcer activity of MEMCL was also investigated using the ethanol-induced gastric ulcer. From the results obtained, MEMCL, at all doses tested, exhibited a significant and dose-dependent reduction of ethanol-induced gastric ulcer formation with the percentage of antiulcer ranging between 63 and 95% in comparison with the reference drug, 100 mg/kg ranitidine, that produced 70% protection. In addition, all doses of MEMCL exerted significant and dose dependent inhibition of indomethacin-induced gastric ulcer formation with the percentage of protection ranging between 47 and 69%. In comparison, 100 mg/kg ranitidine exhibited 78% antiulcer activity. Histopathological evaluation revealed the extract potential to reverse the toxic effect of ethanol and indomethacin and returned the stomach to almost normal mucosal architecture that is comparable with protection exerted by ranitidine. Moreover, pre-treatment with 70 mg/ kg L-NAME significantly worsened the gastric ulcers in MEMCL- and 100 mg/kg carbenoxolone-treated groups and this unwanted effect of L-NAME was reversed by 200 mg/kg L-arginine. These findings indicate the participation of NO in the antiulcer potential exerted by MEMCL. Pre-treatment with 10 mg/kg NEM, in contrast, significantly reversed the antiulcer activity of MEMCL and increased the gastric ulcer formation in comparison with saline pretreated group that is also receiving MEMCL. These findings indicate the participation of endogenous sulfhydryl compounds in the gastroprotective activity demonstrated by MEMCL (Sani et al., 2012).